Here's a project that I'm calling Iced Electronics (Iced E). There are currently four different circuits here. The first uses different colored LEDs that were frozen with the battery pack inside an empty Pringles can. The circuit is protected by a clear sealant and to make sure it's not on while it's freezing, a tilt switch (a metal ball in a canister) is used as an on/off switch. After being frozen, the circuit turns on when the circuit flipped over. The second circuit is simply an 8mm WS2812 LED buried in a medical examination glove filled with water and frozen. This is the same circuit as I did earlier (WS2812 ATiny85 project) with some new firmware that fades through red, green, and blue. 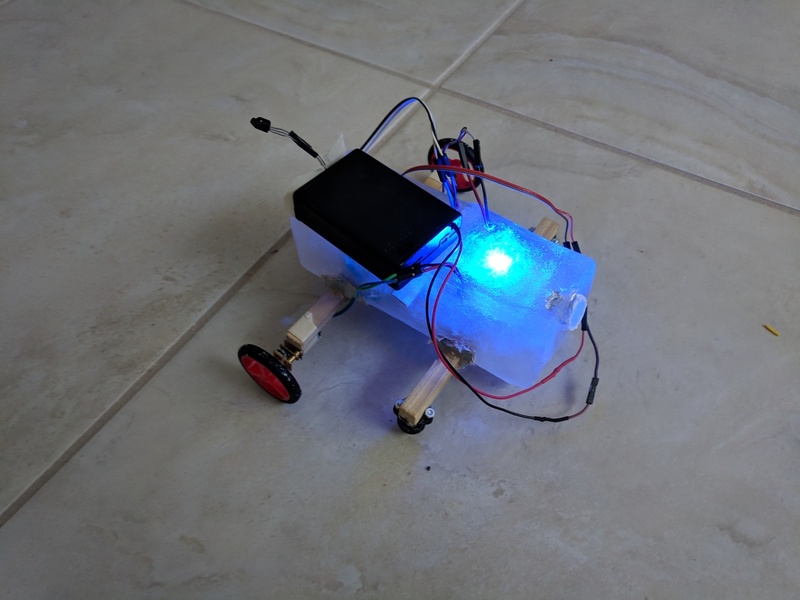 The third circuit is a remote controlled car where the main circuit is frozen in the ice, this time with the battery pack outside of the water. I also put a couple drops of vanilla in the water before it was frozen... you know why. The last circuit, which isn't shown in the video, is a circuit that uses a DS18B20 1-wire temperature sensor with an ATtiny85 taking a reading every 15 minutes or so and logging it to an eeprom. If the circuit is turned on with PB3 connecting to ground, instead of logging it will dump the contents of the eeprom out the serial port. I didn't post any source code or schematics for this project, mostly because most of the circuits were either something I had done earlier that can be found on my website or similar enough. If ayone really wants them, let me know and I might post them. This project was actually a lot harder than it seems. The circuits have to be sealed somehow to make sure they function properly in ice. For the first project was sealed with DAP Ultra Clear. Both the circuit and the battery pack.. anywhere there was metal was covered in this stuff. I avoided as much as possible getting any of the sealant on plastic parts of the LEDs so the light can shine through better. I used a mechanical tilt sensor between the battery and the circuit so that the circuit will only turn on when the circuit is right-side up. This made it possible to freeze the ciruit and save all the battery for running the circuit. When I first turned the circuit right-side up to turn it on, it seems therewas either a bad connection or the metal ball didn't drop. After a couple hours of thawing (the battery was still submerged in the ice) I was able to shake it and the circuit turned on. The second project was much simpler since I kept all of the circuitry except for an 8mm WS2812 controlled LED out of the water. 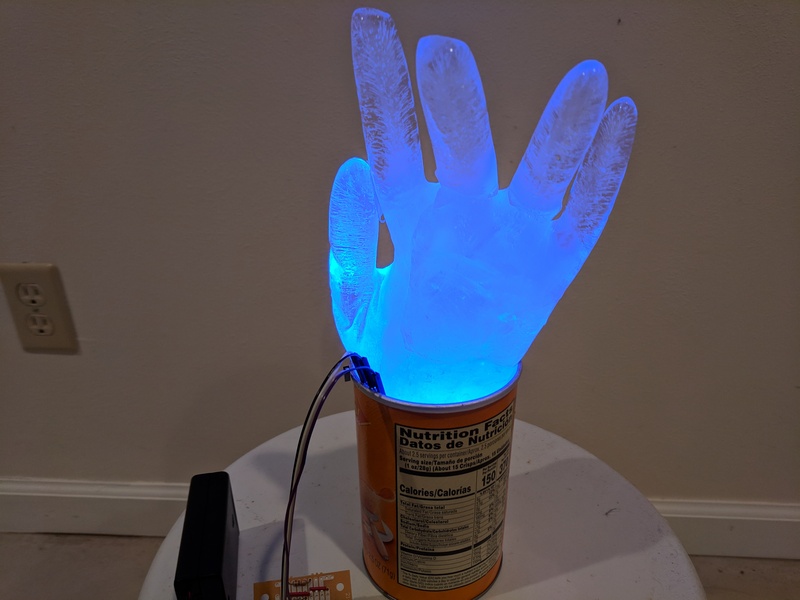 I used hot-glue to cover the leads of the LED so it could be dropped into a medical examination glove filled with water and frozen. I ended up making 3 of these just because they were kind of neat. Next year I might wait for a winter storm and put one of these in the yard to freak out people walking by :). The last project was a total pain... a remote controlled car made out of ice. It took me a few tries to this one right. The first time I used a box from an Apple mouse which was so thick that while I was pealing the box away from the ice, the axles brok off. Second try I trie forming the shape of the car with aluminum foil, sealing the axles with hot-glue. I couldn't get that not to leak. My last try was a container that originally held coconut water. I really don't like drinking that stuff, but if that's what it takes to make an R/C ice car, I was willing to suffer through it. I had a blue LED in there, which not only looks neat but was pretty useful in knowing if the circuit was working. I think the left motor was having some trouble since it seems like when that motor turns on the LED would dim (pulling too much current.. maybe one of the gears got gunk in it) and it just seemed to have some issues. The car circuit was sealed by taking a ziplock bag and cutting off the right side of it. I put small pieces of masking tape where the holes should go for the wires and then used an exacto knife to cut slits on them. I put the wires through and sealed it with hot glue. I originally made a first attempt at this where I didn't use masking tape and sealed with straight rubber cement, but I think it leaked a little. The ziplock bag is sealed on the open side with rubber cement and then rolled up and held together with a rubber band. The final circuit is a temperature logging circuit. I took a pervious circuit I made (a smaller version of the ATtiny85 BLE thermometer) and modified the firmware so if it's turned on without PB3 connected it will take a reading every 15 minutes or so and log it to eeprom. If the circuit is turned on with PB3 connected to ground it will output over RS232 as ASCII all the readings it took. 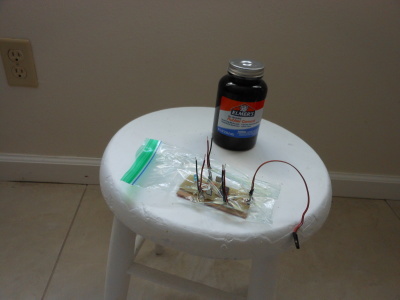 This circuit was simply put in a ziplock bag with a 4.5v battery pack and put in a Pringles can of water. After 17 hours I put it under warm water and took the circuit out. It was mostly dry except for a small area of the circuit board had a little ice. The battery pack, oddly, had quite a bit of ice in it. I wrote a Python script that turns logged in the eeprom into floating point Celcius values and used GNU Plot (graph shown below) to show off the data. Seems the temperature oscillates between -15C to -18C. I put the circuit back in the freezer for a little while after (without any water) and the temperature dropped down to -20C before I took it out (only gave it about an hour or so). This is a hand made by freezing water in an medical examination glove. In this picture the WS2812 LED is glowing red which in this picture makes some really neat patterns, especially in the thumb. Clicking on the image will show the original hi-res pic with much more detail. Here's the same hand glowing blue. The lights are on so the Pringles can is visible. 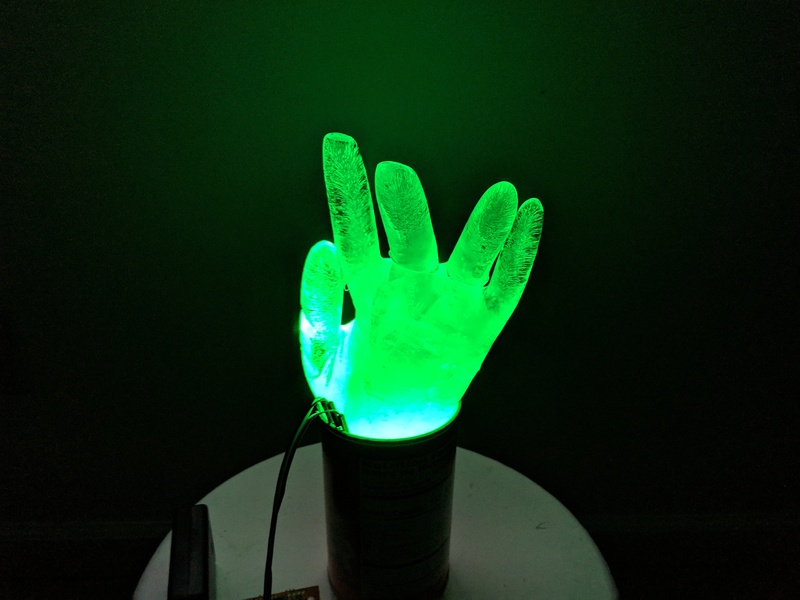 Here's the same hand glowing green. 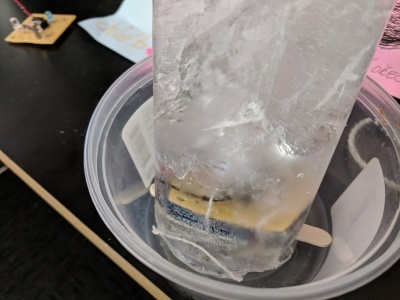 Here's the first circuit with 3 LEDs and 2 AA batteries frozen in an ice block. The circuit is supposed to turn on when turned right-side up (with a mechanical tilt sensor), but the circuit had an issue until it thawed a couple hours. 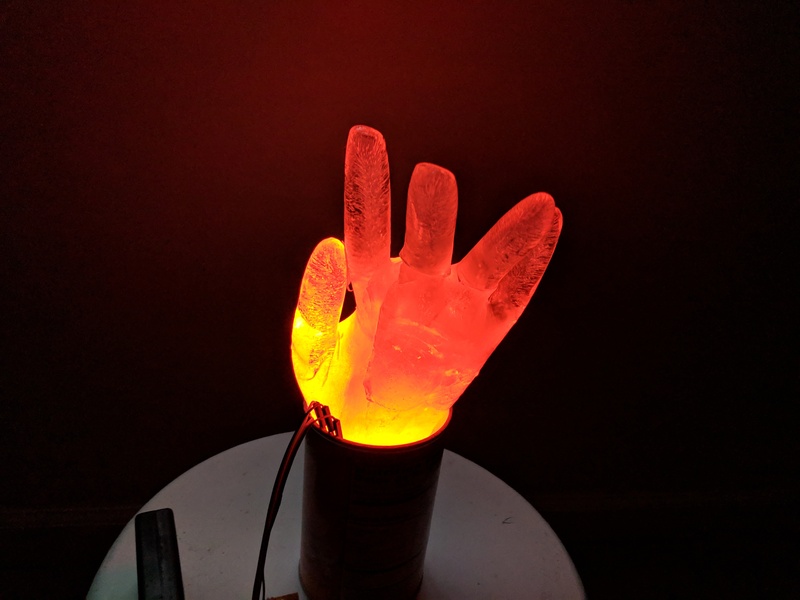 This actualy turned out pretty neat when it functioned... kind of looked like some kind of crystal'ish movie prop glowing different colors. Here's a simple circuit I built using an ATtiny85 that take input from an IR receiver to control two motors. I sealed the circuit in a ziplock bag that was cut off on the side and had holes poked in the top so the wires can stick through. In the final circuit, masking tape was put over the holes and hot glue sealed the circuit. Rubber cement is used to seal the bag shut and it's all rolled up in a rubberband. Here's the car from the video. 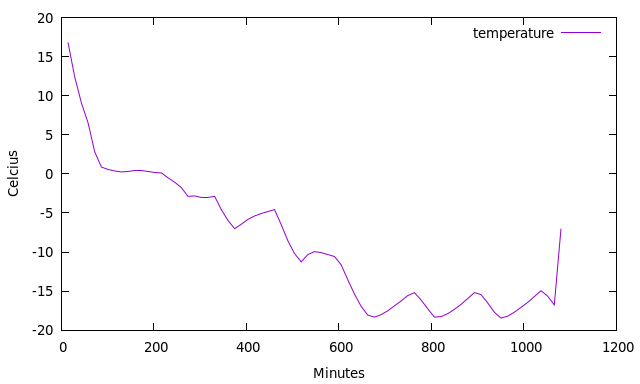 This is a graph created by gnuplot showing the temperature sensed by the 4th circuit in Celcius over time in minutes. The last reading at the end was taken while the circuit was out of the freezer and probably under warm water already.